Marina Warner's 'Once Upon a Time' has many things to recommend it, not least of which is an excellent bibliography. I have a reasonable collection of fairy tales and folklore but the only version of Beauty and the Beast I had was Angela Carter's take on it. From Cupid and Psyche, through the more chivalrous versions of the loathly lady story, and of course Beauty and the Beast this has always been one of my favourite fairy tales. Carter nails it's appeal in both 'The Courtship of Mr Lyon' and 'The Tiger's Bride'. The first is a fairly traditional telling but in 'The Tiger's Bride' the beast stops pretending to be a man and beauty is transformed into a tiger too. Of course it's nice for Beauty when the Beast is revealed to be a handsome prince, or at least it's the outcome you expect as a child, but it's thrilling when Beauty becomes the Beast. 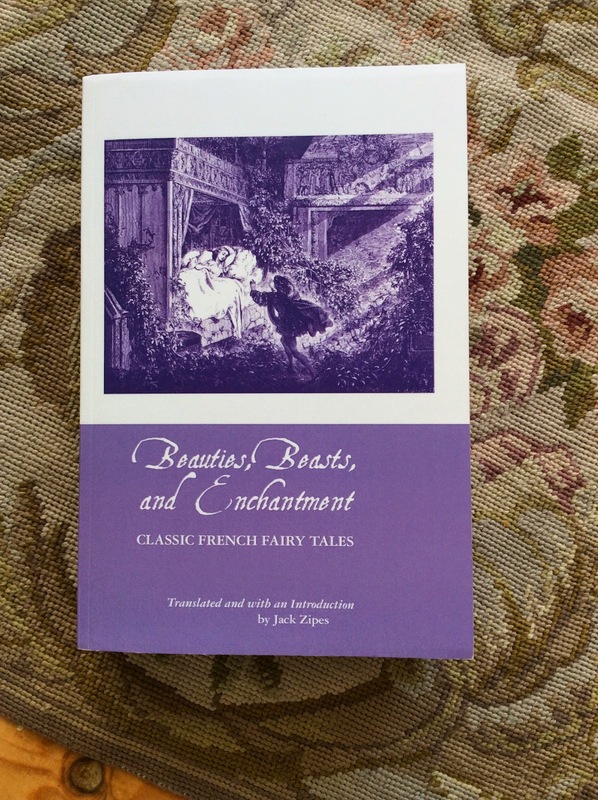 'Beauties, Beasts, and Enchantment' is a collection of classic French fairy tales translated and introduced by Jack Zipes. It's a hefty doorstop of a thing and my copy appears to be some sort of print on demand edition. The illustrations have suffered a bit because of this - some, though not all, look like photocopies - the text is fine, so I'm very happy with it. There are 2 versions of Beauty and the Beast. The first by Gabrielle-Suzanne de Villeneuve is very, very, long (a good 80 pages; novella, almost novel length) it's also extremely complex (even confusing) with the beast/princes entire back story and the revelation that Beauty was adopted, her true parents being a fairy and a mortal king. Whilst it really does tell us a lot about the manners and attitudes to social class in France in the middle of the 18th century it also left me with a profound sympathy for Beauty's jealous sisters. The second telling is the far more famous Jeanne-Marie Leprince de Beaumont version (basically the one that everybody knows). It is essentially de Villeneuve's story stripped down to it's basics (it's a much more manageable 10 pages) and focusing on a moral message for young ladies; industriousness, modesty, diligence, self sacrifice - these are the virtues she celebrates. The number of the merchant's children has even been shrunk from an extravagant dozen to a rather more prudent 6. The version of the loathly lady that first captured my imagination was the marriage of Sir Gawain. It boils down to this; the king has to answer the question "what thing it is all women most desire?". The answer proves elusive until an old hag promises to tell him in return for marriage to an attractive young knight. Sir Gawain steps up to the mark and the answer is duly given. Women, it turns out, most desire to have their own will. On their wedding night Gawain (struggling manfully to show an adequate amount of enthusiasm for his bride) is stunned when she is revealed as a lovely young woman. There is an enchantment but he now gets to choose - beautiful by day, or by night. Very sensibly Gawain gives his wife the choice which entirely breaks the enchantment. Leprince de Beaumont apparently meant her improving tale to reconcile girls to the idea of arranged marriage, the magic of the story is that Beauty continues to make choices, and that it lends itself so well to that most pernicious of female fantasies; that the love of a good woman can change a man. I feel a little bit bad about this book; it's a review copy which I just haven't been able to get in with. It sounded good enough to say a definite yes please too and different enough from my normal reading choice to make an entertaining change but at about half way, and after a good week of plodding through it I've given up. After a break in at the home of a wealthy business man some fake passports come to light, when the police make further investigations they also find 3 skeletons down in the cellar though they turn out to be old enough to have nothing to do with the current owner, another dead body in the woods at Sandringham wearing cloths that associate the victim with the same business further muddies the waters. Add to this a set of painful family circumstances for the De Vries family and some uneasy relationships with their employees and the stage us well and truly set. Unravelling the De Vries story, the mystery of the bodies in the cellar, and solving the current murder adds up to the sort of multi stranded story I generally enjoy. I skipped to the end so have a good idea of what happened - at least 2 of the strands resolve satisfactorily, the historic case which I was most intrigued by veered off in a direction that left me cold (I won't give spoilers) though there's no reason why another reader wouldn't enjoy it. 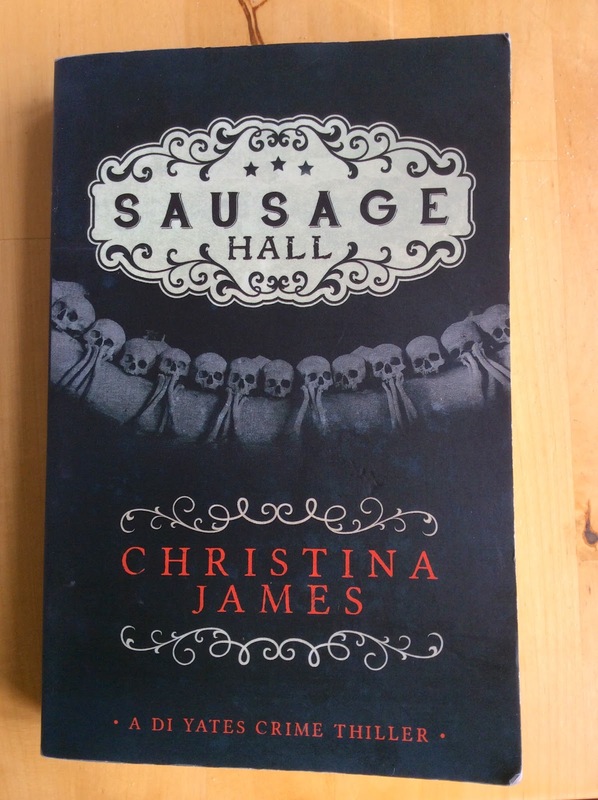 This is the second book this year that I've found myself having a total lack of chemistry with, it's not badly written, the plotting is clever, but I have no sympathy at all with the characters and that in turn makes me picky about James' style. There are details which felt over explained (too many 'as you knows' and 'as I said's') and probably because it's part if a series, a lot of incidental stuff about characters whom I expect will matter more in subsequent instalments but which is distracting if you're not invested in the series, and just generally that lack of chemistry which would have made any little niggles feel irrelevant. What did stand out, and what I skimmed through the rest of the book for was to work out the relationship between the De Vries family which was both complex and convincing. In the end this one wasn't for me though, I'll be sticking with the British Library crime classics - territory I'm more comfortable in. There was a time when I wasn't very keen on second hand books; they can be such personal possessions, and then the pleasure of an entirely new book is such a wonderful thing that used just wasnt very appealing. But that was back when I had more disposable income. These days finding a good second hand book is one of the small but significant pleasures in life and today I found a beauty. There's a charming market town about half an hour from Leicester (Market Harborough) which has all sorts of things I like (kitchen shop, amazing old style hardware shop - by the name of Gilbert's - nice little gallery type places, a river running through it that supports both otters and kingfishers as well as ducks, and plenty of other good things) including opportunities for book bargains. Just before I caught the bus home I picked up a copy of 'The Apocrypha', something I've vaguely wanted since my student days, for a very modest £1.50. 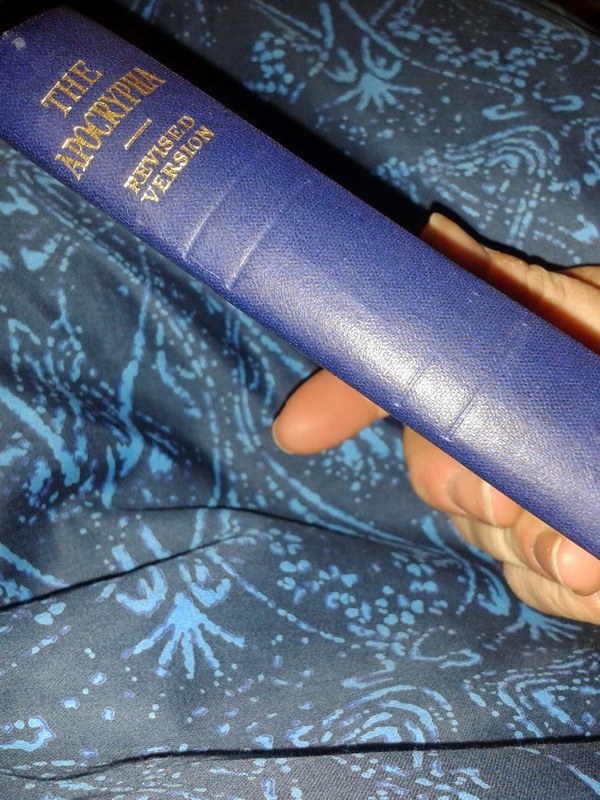 Better yet it's a charming little blue hard back from the dim and distant past of Oxford World's Classics - perfect pocket size. I was particularly glad of it when a fairly major traffic accident held us up for 2 hours on the way home. It was much better than the book is been struggling to read before (which didn't have a dragon, The Apocrypha does - Daniel slays it). Nor had I realised that this is where the story of Susanna and the elders can be found, but now I know I'm even happier with my find. Time for some more improving reading before bed! 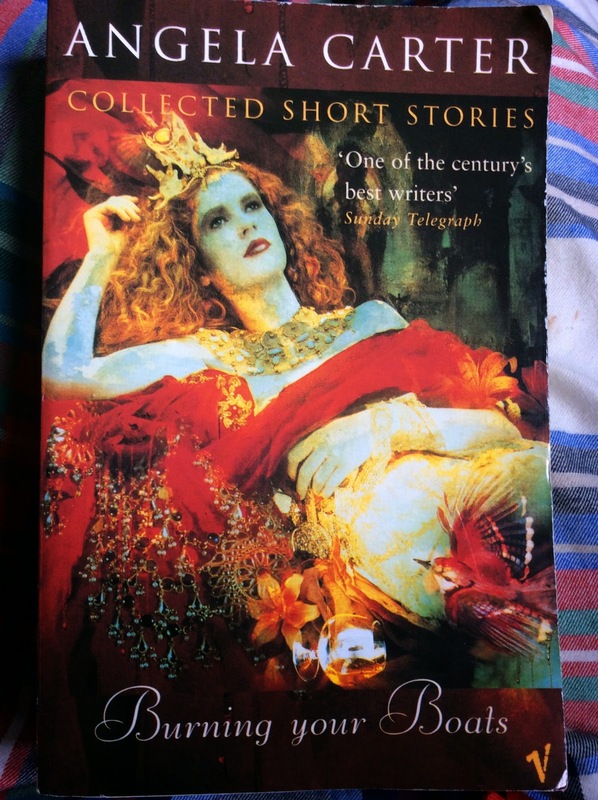 After reading 'Once Upon a Time' - where Carter is a big presence - it seemed sensible to go back to 'The Bloody Chamber', or to be specific 'Burning your Boats' the collected short stories; great for saving money and space, not so great for introductions which is a shame. I can't remember when I first read 'The Bloody Chamber', probably some time in my 20's, but I clearly remember the impact they had. Until 'The Bloody Chamber' my experience of fairy tales had been childhood and Disney versions, Carter's opulent, dark, sexually charged versions were unsettling to the point of being iconoclastic. Re reading them now it's still easy to understand why I found the book so disturbing first time round but having encountered so many more tellings of these stories in the intervening years along with a fair amount of theory the effect is somewhat diluted. I can also begin to appreciate how influential Carter has been both on the telling of fairy stories - I was going to say especially to adults, but then started to wonder how versions meant for adults have changed how we present these stories to children - and on my own imagination. In the absence of an introduction Wikipedia tells me that Carter said "My intention was not to do 'versions' or, as the American edition of the book said, horribly, 'adult fairy tales', but to extract the latent content from the traditional stories." The more I think about that statement the less clear I am about what it actually means. As for the stories themselves, most of them seem to be intent on having fun - of which Puss-in-Boots is the best example. It's bawdy and funny; a mildly dirty story that could be told in a pub, along with the wolf stories, and perhaps The Tiger's Bride it also feels the most 'authentic' (for want of a better word) to me. Authentic is a clumsy choice to try and express what I mean but what appeals to me about the Grimm's tales is the way they're so stripped back to basics. The framework remains and experience shows that each teller can add whatever details appeal, or can be imagined, or seem appropriate for the listener - which is surely how it should be. The most disturbing tale in 'The Bloody Chamber' is without doubt The Snow Child, as pared down as anything the Grimm's offer up it's deliberately confrontational with something of the feel of a crime report about it. It's brevity gives the reader nowhere to hide, as Puss-in-Boots does, from images which are truly shocking. For all the gothic splendour of the other stories it's The Snow Child that demonstrates Carter's power as a writer, and it's done in just over a page. Something I'd forgotten about 'The Bloody Chamber' is how Carter recycles her own images and ideas, working out the same plot with different characters in different stories. I'm not sure if this was meant as a collection from the beginning or if it became a place to keep a body of work but there was a point when reading began to feel like an academic exercise, to get the most out of the book it's perhaps best read sparingly, it certainly rewards a bit of time as well as thought. Dinner was cooked, eaten, and mostly appreciated (not everyone loves pomegranate as much as I do - mother, I'm looking at you), my oven behaved itself, and after everyone left before the washing up it only took an hour and a bit to clear up. 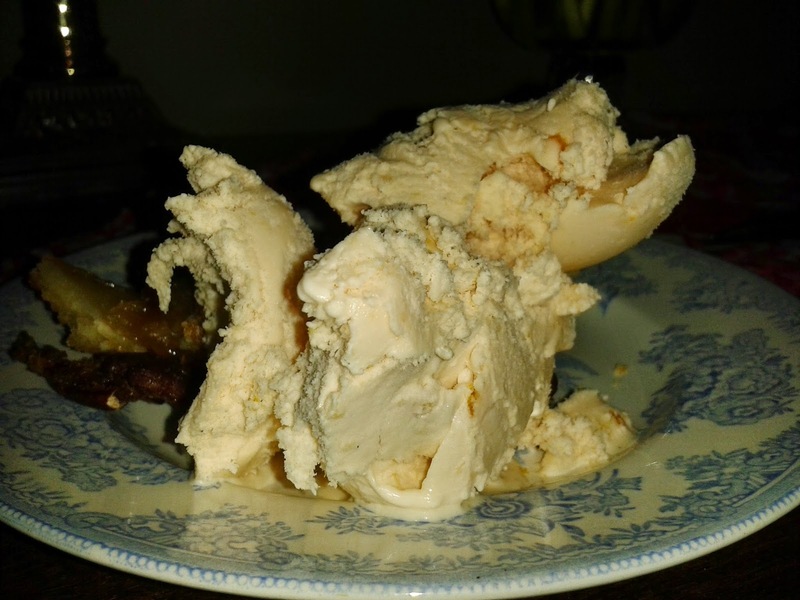 The thing I was most pleased with was the marmalade ice cream, I've made it before with a Seville orange marmalade, it had a great texture but the flavour was a bit overwhelming on it's own. This time I used the blood orange and vanilla marmalade I made a few weeks ago, on it's own the marmalade (how many times can I say marmalade in a single sentence?) is sweeter than I prefer for toast but in the ice cream it came into it's own. The orange flavour is brilliant, the slightly bitter marmaladey edge makes it interesting, and altogether it was a great success with either slices of oranges sprinkled with nutmeg, or pecan pie (and would probably be even better with walnut). The recipe came from a Sarah Raven book and is delightfully simple (she's brilliant for ice cream recipes, I've found some crackers in her books) it's 300 ml's each of double cream and full fat natural yoghurt, 350g of marmalade, and 3 tablespoons of orange juice all churned in an ice cream maker for 20 minutes. It's worth blitzing the marmalade in a food blender for a minute to make sure there are no big chunks of peel left, or putting it through a sieve if you want no peel at all. And that's it. A few hours in the freezer to make sure it's hard enough and it's ready to eat, the ice cream maker isn't even necessary, it could just be mixed up and go straight into tubs in the freezer. I have a family gathering convening in my flat on Wednesday so have spent a happy evening menu planning (the afternoon mostly involved hoovering - which doesn't make me quite so happy). There should be 7 of us so it's a chance to cook something magnificently calorie laden for a pudding (quite possibly a pecan pie), use a selection of all my favourite pots and pans, and generally have some fun in the kitchen. It's rare that I cook for more than 2 or 3 people these days - the long boozy dinner parties that were a fun part of being single/child free/robust of liver/in charge of my own working hours have mostly gone along with my 20's. I would regret that more if I didn't have vivid memories of some horrible hangovers. Still it's a kind of cooking I enjoy for all sorts of reasons, not the least of which is the menu planing. Those glorious few hours spent happily browsing make up for the more mundane chores which precede a visit from family who will quite happily point out deficiencies in my housekeeping (fortunately candlelight will hide a lot). My flat currently smells of a heady mix of bleach, furniture wax, and Diptyque's Epice candle (ridiculously expensive but it smells so good - and can fight of bleach for goodness sake) so an effort has been made. The most depressing thing about housework is how once you start you always find more to do, and there are almost always better things to do. My family (and this is probably fair) have such low expectations of my domestic abilities that when my mother saw some washing powder specifically for wool she asked (with genuine shock) if I had bought that myself? It took quite some time to convince her that I had, and what's more knew what to do with it. 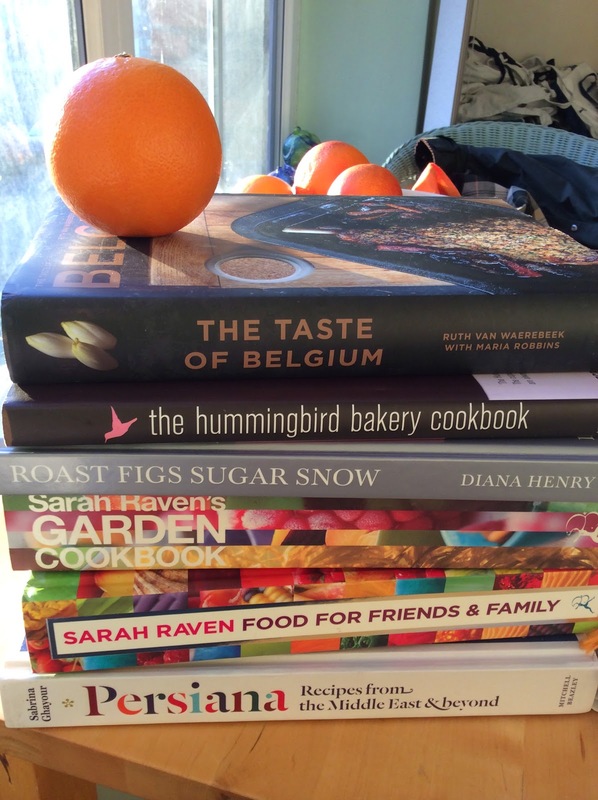 Meanwhile the cookbooks... I've sifted through lots of them, devised plans and fantasy menus, finally settled on something that my increasingly decrepit oven can probably be coaxed into coping with, tagged plenty of things to go back to and generally been inspired. The Sarah Raven books (marmalade ice cream) have been something of a rediscovery. I've not had a proper look through for a while so had forgotten just how appealing they are. 'Persiana' is excellent for good tempered, low maintenance, dishes with robust winter beating flavours (pork with some sort of pomegranate sauce). I have lists, I have a plan, and have done enough cleaning; they are after all my family, they know what to expect! 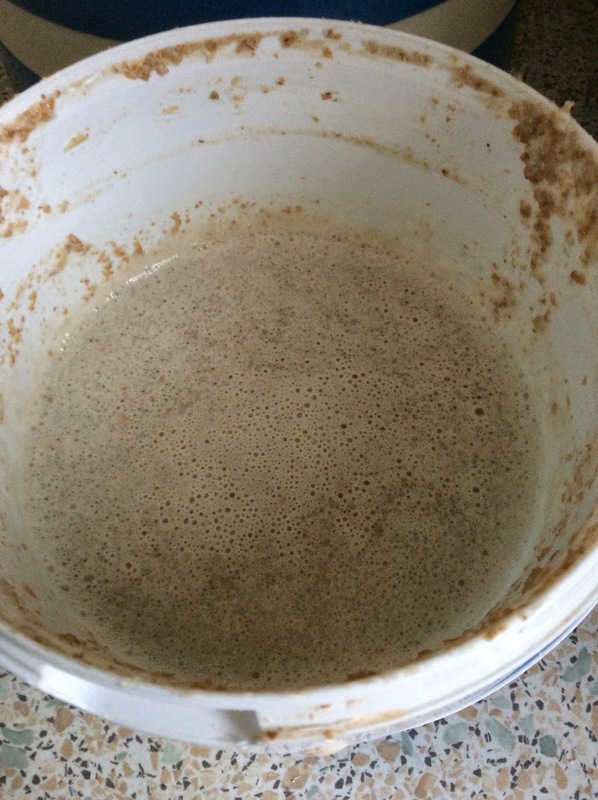 Firstly a confession; I named my sourdough starter - he (I think it's definitely a he) is called Bob. This isn't generally my style - names are for things that that will answer to them, Bob doesn't, and when someone told me that people do name their starters I didn't really believe them. Silly as it sounds though it serves a purpose; Bob is a living thing that requires a certain amount of attention, endowing him with a name has helped me establish a routine whereby I remember to feed him regularly. We've been together for 4 months now so I'm beginning and are building up a relationship. He has a not unpleasant fruity aroma and prefers Waitrose organic stoneground whole meal flour as his main food. I once fed him some strong white bread flour but he was not impressed (it reacted quite oddly). We have both got used to Waitrose flours generally, and now I'm paying more attention to the flour I use (specifically in terms of how it reacts) I'm really surprised at the difference between them. The most disappointing so far has been a decidedly upmarket malted one that persists in making a somewhat heavy loaf. Getting to know your flour is probably one of the best bread making tips I've found. Bob lives in the fridge - low temperatures slow the fermentation which makes him more predictable regarding when he should be fed - which is once a week and ideally when I've used some to make bread but I don't bake often enough for that to be entirely reliable (hence the name). The only downside to life in the fridge is that I need to remember to take him out in good time to pep up before I want to use him (it has to be actively fermenting to give a decent rise). He is also inclined to separate (a clear dark grey/brown liquid about an inch deep forms - turns out that this is quite normal, but I didn't know that at first. It seems he also appreciates a bit of exercise in the form of a turn being vigorously whisked in the mixer every now and then - I guess this is how he meets new yeasts. What put me off making sourdough for years was the amount of time that seemed to be involved in making a loaf but it turns out that the slower nature of it all suits my day off routine far better than expected - there's plenty of time to nip out and do things whilst it's proving so I'm happily making bread far more regularly (Bob has to earn his keep) even if that still is only weekly. All of which is to say that the sourdough experiment has been a resounding and ongoing success. I've seen a bit of discussion around recently about the lack of a book programme on television and what it should include. It's the kind of question that few book lovers are likely to resist, so what would I like to watch? Now ideally (for me) any such programme would follow my particular interests almost exactly, accepting that probably isn't possible and wondering what might appeal more broadly the most important thing I can think of is that I want to hear about books that would otherwise pass me by. I want to know about independent publishers, favourite bookshops up and down the country, I want something that isn't London centric. I'm sort of interested in interviews with authors - though as I don't read a lot of contemporary fiction not that interested. Archive interviews might be a different matter. I would love to hear more about the business of publishing; everything about how a book is put together, and I'm always interested to hear about the books that somehow didn't catch on. Literary fiction is great but some genre stuff would be good too, and definitely features about classics, all those books on the shelf you haven't quite got round to reading yet, and yes; even out of print books. I don't much care for things fronted by 'celebrities' - what I love about blogs is getting a sense of the blogger as a reader, building trust in their taste and opinions takes a bit if effort. The same is true in bookshops - casual conversation at the till (which I know the seller has to make) can lead to all sorts of interesting recommendations (and some that should be avoided). So definitely people who first and foremost give the impression that books matter; booksellers, bloggers, publishing types, academic sorts, writers, reading group regulars - all good. And I don't really need to hear about best sellers - they already get enough attention - but then I might want enough information to make me feel I know what I'm talking about without having to read the dratted things. In the end though the question is also do we really need such a programme? I subscribe to Slightly Foxed which covers older books, listen to Radio 4 which serves book lovers quite well, skim through the review pages of The Guardian, along with any other broadsheets that come my way, And read blogs that do dovetail with my own particular set of enthusiasms as well as introducing me to new books. In short I feel quite well served already and whilst book discussion isn't necessarily very photogenic it works extremely well on the radio. On the other hand the proliferation of book festivals suggest that there are no shortage of people prepared to spend money on watching others talk about books and if that's the case then there's clearly an audience for a book based programme that manages to be inclusive, intelligent and imaginative. What would you want to watch? After only 10 days and an outlay if not more than £20 I have a scarf. Knitting is clearly something to do for reasons other than the end product - which I'm pleased with for all sorts of reasons but I could probably have bought something similar for much the same price and without the investment of all that time - suddenly knitwear like this from Mati Ventrillon looks incredibly reasonable. Of course the reasons other than the end product were very much why I wanted to relearn how to knit, there are a few of them. I like having something to do when I'm not really in the mood to do anything very much - jigsaw puzzles, solitaire, twitter anything which can be done sitting down and doesn't demand to much effort works. Knitting is perfect, enough concentration to count and keep track of where you are is all that's required and having something tangible at the end of it is great as well as relaxing. There is also the pleasure of making something - never to be underestimated, creativity of whatever sort has an uplifting sort of effect and who doesn't appreciate that. 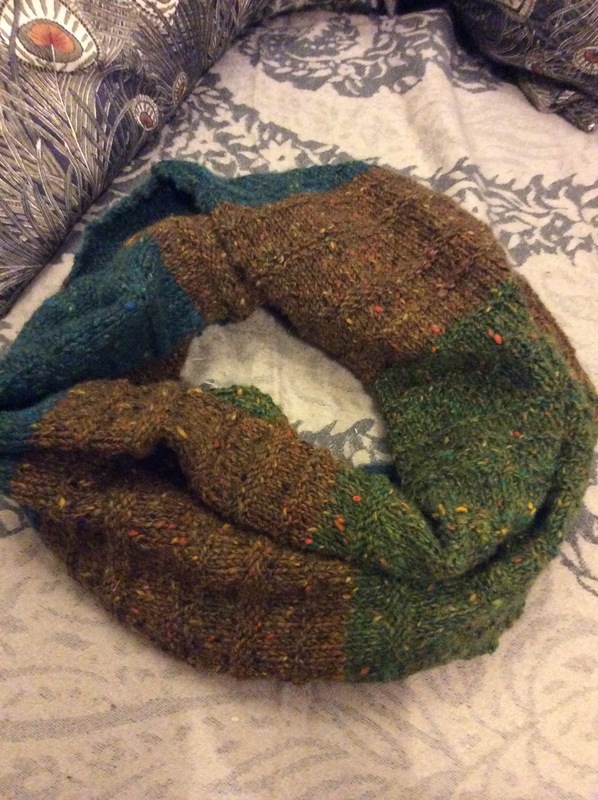 And then there is the particular pleasure of feeling a little bit smug when someone compliments you on something you've made (or that's been made just for you - the tea cosy my sister knitted me is just such an item) whatever it might be. My scarf was an easy project. Three balls of yarn (50g each) which I knitted until the thing was long enough. I choose wool with tweedy flecks of colour and a slightly uneven thickness working on the theory that it would probably hide a few shortcomings - it probably has - and played about with plain and purl stitches for much the same reason with the added benefit that it made it more interesting to knit. 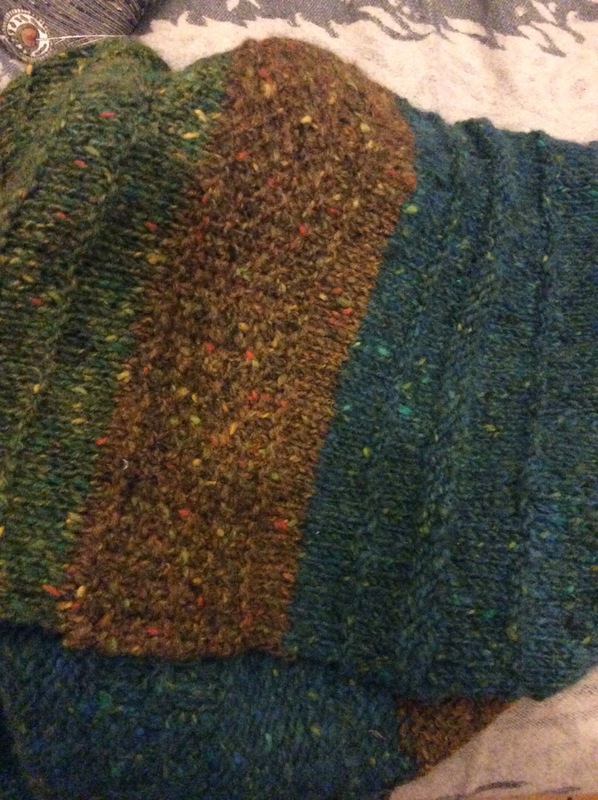 It's amazing what you can do with 2 stitches in the way of adding a textured pattern. I've already embarked on a second project so I've clearly got the bug. I'm really looking forward to hitting the woollen mill back in Shetland this summer - they have some great colours it's going to be a real pleasure to play about with (whatever the results are).